This is the base patch for NAS Jacksonville, FL. They currently fly the P-3 Orion P-8 Poseidan (and flew the S-3 Viking) out of there. This is the large, light-blue version of the base patch and does not come with velcro attached. This patch is the base patch for NAS Key West, FL. They host the best Air-to-Air training on the East Coast, and each RAG class at VF-101 get to go down there for several weeks for some awesome BFM and ACM flying!! 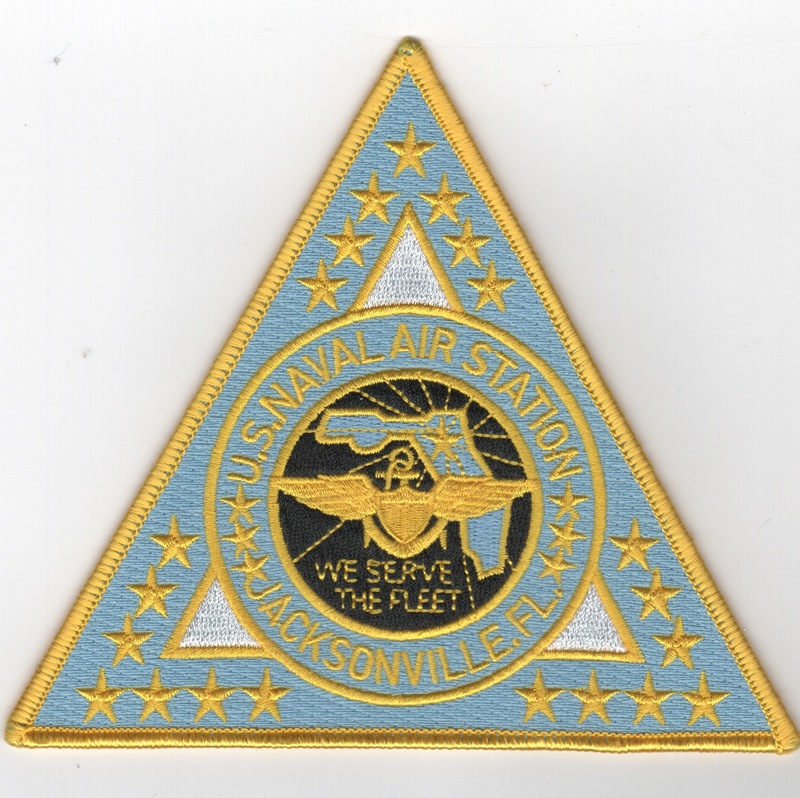 This patch is the base patch for NAS Kingsville, TX. It states "Flying the Future", a reference to them training the US Navy's future naval aviators in the latest technological aircraft. 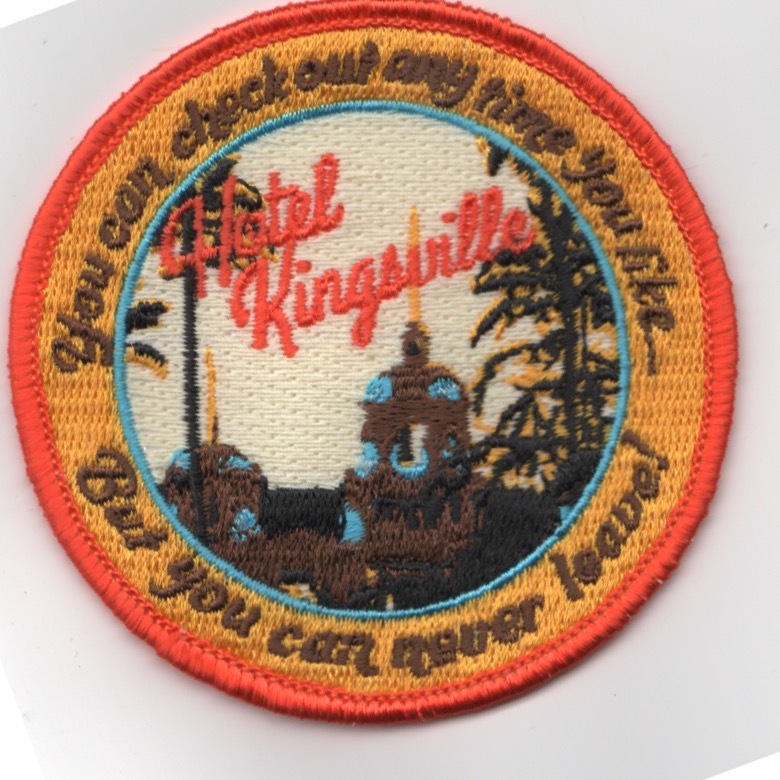 This patch was created by one of the US Navy Pilot Training classes at NAS Kingsville, TX that says "YOU CAN CHECKOUT ANY TIME YOU LIKE, BUT YOU CAN NEVER LEAVE! This patch does not have velcro. This is the West coast base for the Navy's F/A-18 Hornet located out in the desert of California. Lemoore is actually located in the San Joaquin Valley North and Slightly West of Los Angeles. It is about Half way between L.A and S.F. in an area that is primarily Agriculture. In fact the Navy rents out acreage on the base for farming. This is the patch for the Base Orndance Division located at Little Creek Amphibious Base, VA. Naval Station Mayport (IATA: NRB,�ICAO: KNRB,�FAA LID: NRB) is a major United States Navy base in Jacksonville, Florida. It contains a protected harbor that can accommodate aircraft carrier-size vessels, ship's intermediate maintenance activity (SIMA) and a military airfield (Admiral David L. McDonald Field) with one asphalt paved runway. Since its commissioning in December 1942, NS Mayport has grown to become the third-largest naval surface fleet concentration area in the United States. Mayport's operational composition is unique, with a busy harbor capable of accommodating 34 ships and an 8,001-foot (2,439�m) runway capable of handling most aircraft in the Department of Defense inventory. Naval Station Mayport is also home to the Navy's United States Fourth Fleet, reactivated in 2008 after being deactivated in 1950. This is the white, triangular version of the base patch for NAS Meridian, MS that hosts the naval jet training community for the US Navy's Fleet. They fly the T-2 and A-4, and are currently using the new T-45 Goshawk. This version of the patch does NOT come with velcro attached. This is the white, triangular version of the base patch for NAS Meridian, MS that hosts the naval jet training community for the US Navy's Fleet. They fly the T-2 and A-4, and are currently using the new T-45 Goshawk. This version of the patch does come with velcro attached. This is the training patch for NAS Meridian, MS that host the naval jet training community for the Fleet. They fly the T-2 and A-4, and are currently using the new T-45 Goshawk. This is the base patch for NAF Mildenhall, England. They have two UC-12M A/C assigned there. This is the base patch for NAS Norfolk, VA that host the E-2C Hawkeye community for the East coast, as well as quite a few of the helicopter squadrons. This patch is for the Aircraft Intermediate Maintenance Department (AIMD) located at NAS Norfolk, VA. They work on USN and USMC aircraft at the intermediate level, the level just prior to having the aircraft sent to the "Depot", but above the level done on the carrier. This is the base patch for NAS North Island, located outside of San Diego, CA. This patch does not come with velcro already attached. This is the color version of the pilot's nametag for the NAS Oceana's "staff" that fly a either Hornets or Tomcats. This is the East coast "MASTER JET BASE" for the US Navy's F/A-18 Hornet Fleet. It used to also house the Navy's East coast Intruder and Tomcat Squadrons. It's one of the only MASTER Jet bases in America and this patch patch does not come with velcro attached. 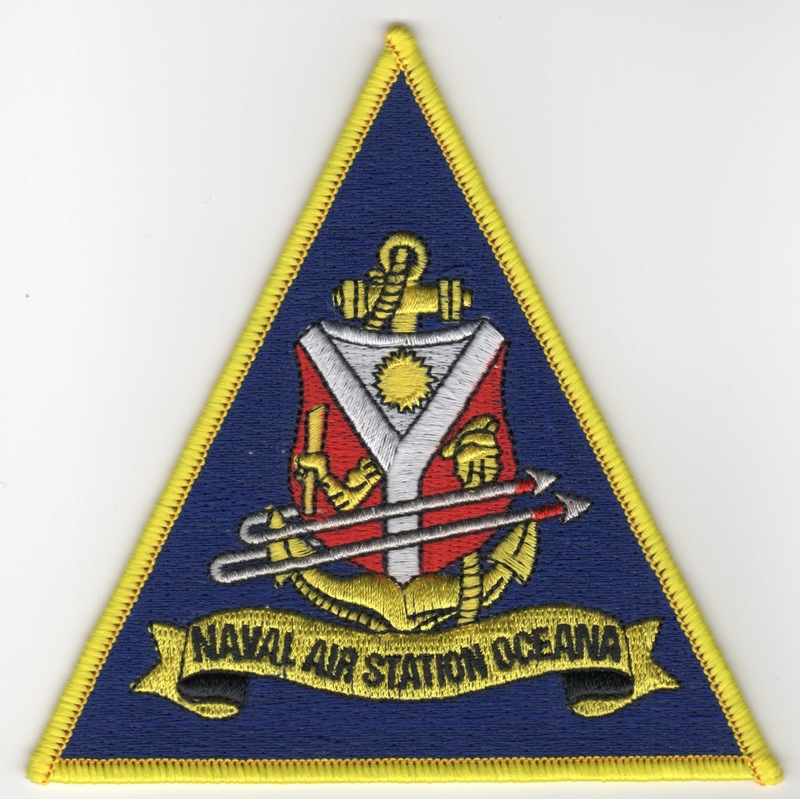 This is the patch for the Atlantic Orndance Command located at NAS Oceana, VA. This base is the home of the Navy's Test Pilot school where most testing platforms are put through their paces. 'Nuf said. This base is the home of the Navy's Test Pilot school. 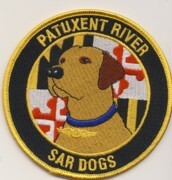 This patch is for the Search and Rescue (SAR) Unit that aids downed pilots during peacetime operations. 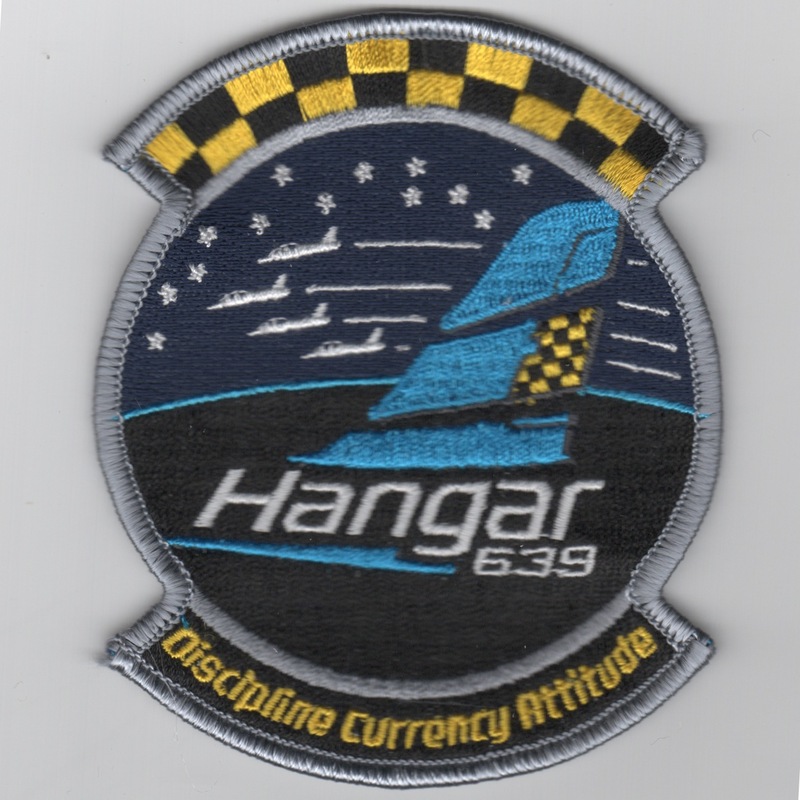 Well, I have NO IDEA what this patch is for.....I do know that it came from the Pax River, MD base and refers to "HANGAR 639" and says "Discipline Currency Attitude" across the bottom, but that's all I know about that hangar. It does not have velcro. This is the base patch for NAS Pearl Harbor, HI commemorating the 50th anniversary of the attack on Dec. 7, 1941. This is a beautiful patch. This is the base patch for NAS Pensacola, FL. They train the Navy's Flight Officers and the USAF Navigators there in the primary, intermediate, and advanced phases. This is the NAS Pensacola Search & Rescue (SAR) patch. It says "All Weather Rescue". 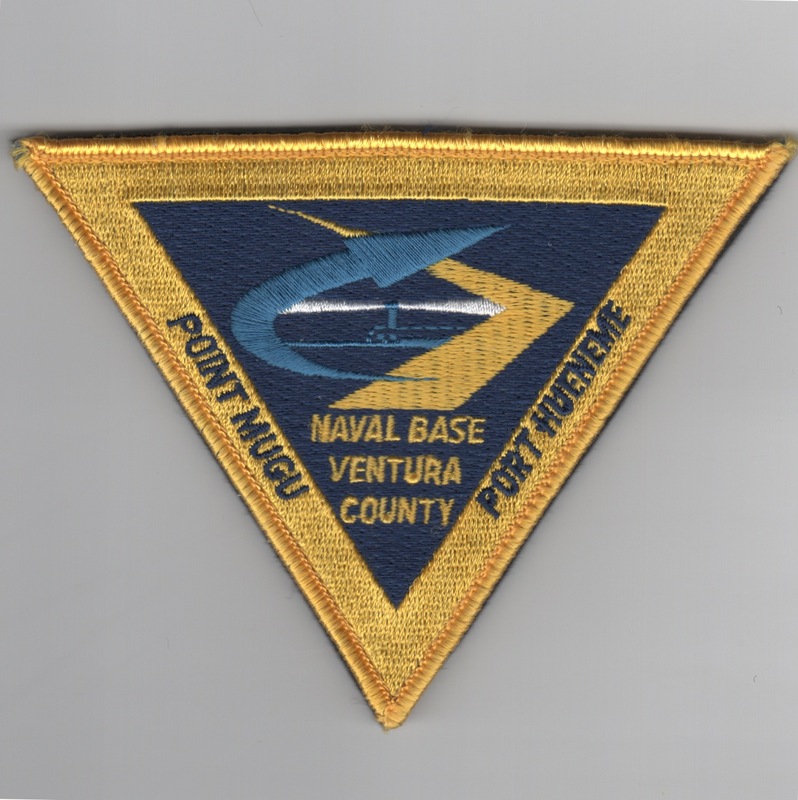 This is the base patch for the Naval Bases in Ventura County, CA.....Point Mugu and Port Hueneme. This patch DOES come with velcro attached. This is the base patch for the Naval Air Station located at Sigonella, Sicily. The P-3C Orion's operate out of there during deployments, as well as serving as a "layover" point for other units enroute to Deployments! This is the fire department patch for the Naval Air Station located at Sigonella, Sicily. The P-3C Orion's operate out of there during deployments, as well as serving as a "layover" point for other units enroute to Deployments! This is the base patch for NAS Whidbey Island, WA, located just outside of Seattle. They train the Navy's EA-6B and P-3 pilots there in their operational and training squadrons. This is the base patch for NAS Whiting Field, located just outside of Pensacola, FL. They train the Navy's pilots there in the primary phase. This is the round version of the base patch for NAS Willow Grove, located just outside of Philadelphia, PA. This is the triangular version of the base patch for NAS Willow Grove, located just outside of Philadelphia, PA. This is the base patch for the Naval Training Center, Great Lakes, IL. This is the "Motor City Search & Rescue (SAR)" patch for the USCG Air Station Detroit. They maintain the safety of the Great Lakes. This is the Instructor Patch for the Weapon Intern Program at Sandia Labs. Homepage | Order USN/USMC Base Patches!